What do you reckon to that, eh? I reckon shandy has it’s place, but only if it’s made with rubbish beer. If you want to drink sweet fizzy stuff with a tiny bit of alcohol in why not try WKD, alco-pops, alcoholic ginger beer and all that other stuff? I guess you could mix quality beers into some sort of godawful beer cocktail, but what’s the point? I know Lambic and Gueze are blended, but that’s just because they have to – for quality control. I’m still wondering how in the name of all that’s holy did Aldi manage to get hold of this American IPA in sufficient quantities to sell it at a quid a bottle in their stores? Don’t hang about long enough to read this review, get down there and stock up before they run out. It’s an absolute, complete and utter bargain. Aldi, will you start stocking up on more US “craft” beers, please? I’ll be shopping at your stores every week if you do – hell, you can even appoint me as your chief consumer taster of new beers if you like…now THAT’S generosity. 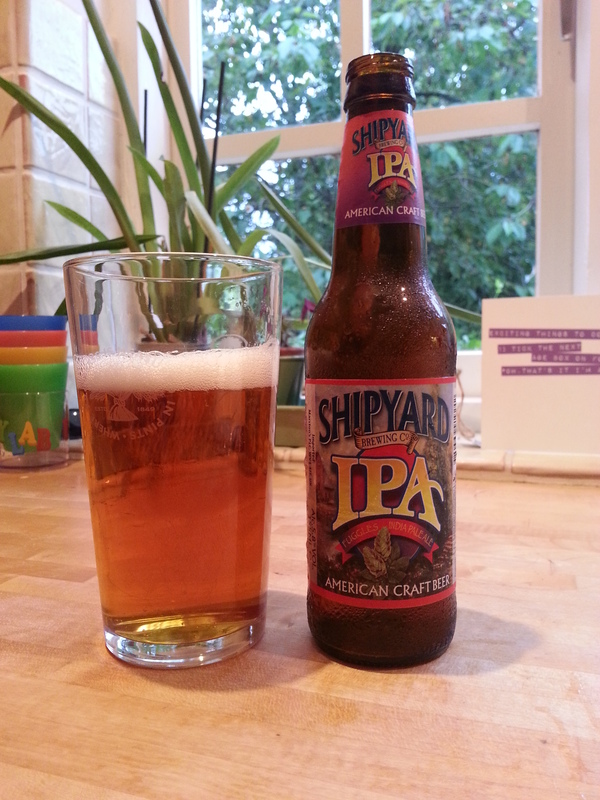 Shipyard IPA is that typical US IPA colour of bronzey-copper-orange with a good solid head retention. 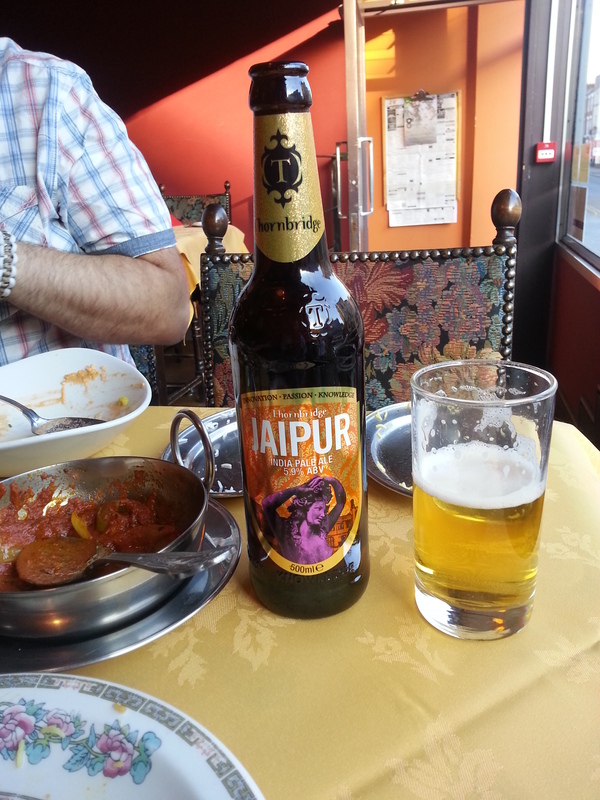 While it’s not as madly hoppy in the aroma as I’d normally like IT’S STILL A QUID A BOTTLE. The fuggles hops that are there are solid enough to let you know this is a US IPA and the malt is more than evident. Shipyard is well carbonated and has a good solid malty mouth-feel. A sustaining and tasty bitterness is backed up with malty sweetness and a hefty dose of lovely hoppy goodness. I still can’t believe it’s only a quid. STOCK UP NOW! You’ve got to love us English for revelling in rude words, haven’t you? 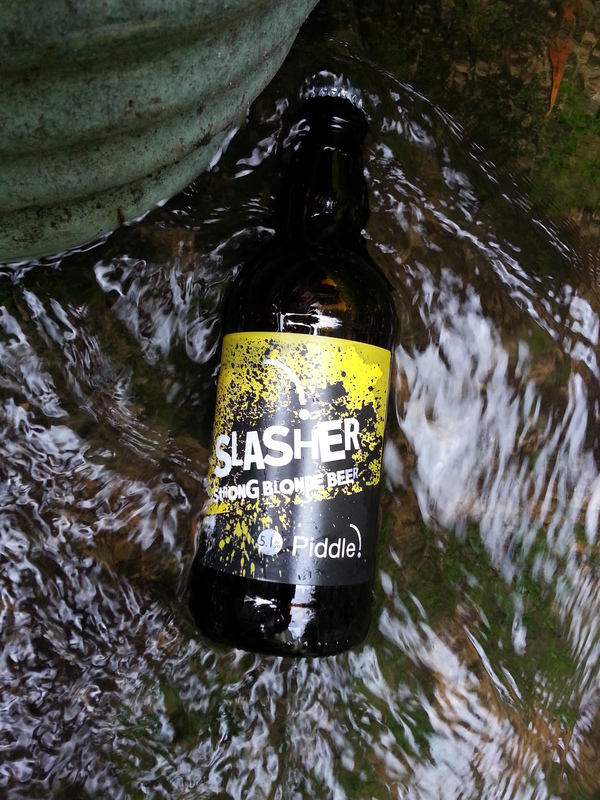 Piddle brewery, despite not actually brewing with any urine at all, are located close to the river Piddle in Dorset. Even though I’m now a seasoned and practically over-the-hill infrastructure architect, I still have a Linux workstation named “Piddle”. Oh, how I laugh still…even though everyone else stopped many years ago. This particular beer is called Dorset Slasher…which again prompts more hilarity, even though it’s years since I really heard anyone say that they were just off for a slash. Maybe we ought to revive the term, just for old time’s sake? The bottle was so full, I mean literally a few ml from the cap – that’s value for money. And it kept it’s carbonation, too. The aroma was zippy, spritzery and lively – almost like those little bottles of French lager that we all drank as kids when someone had done a booze run to Calais, riding over the top of this was a nice hoppy twang that certainly made my mouth water. In the taste was a good solid body with a nice leading malt sweetness, followed by rounded light maltiness; then, finally, some tasty hoppy note accompanied by a gently bitter finish and a really lovely creamy after taste. You really could drink gallons of this at the right temperature in summer. As you can see I chilled mine to stream temperature in my back garden. A very accessible, accomplished and quite lovely pint. Well done, the Piddle crew. When you organize this event next time, please try to make a bigger area for festival-goers to congregate – give some room for people to spread out a bit and make sure the stage with the music is somewhere where everyone can see it. My kids only managed to last about an hour and half before they became over-whelmed by the sheer amount of people compressed into such a small space – especially when we all had to pile in the tent to escape the thunderstorm. It was difficult to navigate the site without tripping over gazebo guy ropes, dog leads, folding chairs and lord knows what else. Oh god, this was so good. Tons of hops, maybe Simcoe – but not at all catty. Pretty much excellent. I love this beer to death. A beer I just had to try because I’ve been curious about this particular New Zealand hop. The beer turned out to be almost fresh cigar-like, thick malt and caramel, some graininess and a good non-citrussy hop hit. 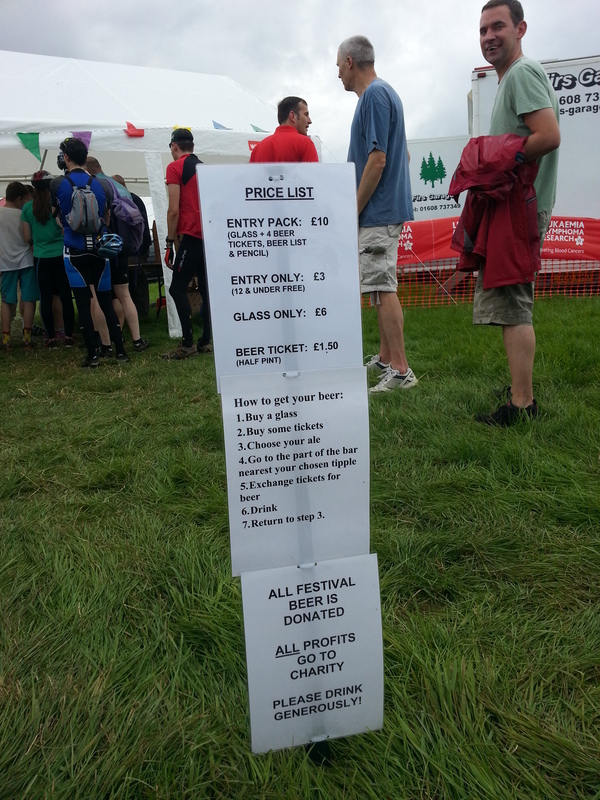 Will definitely be going back to Hooky next year as long as there’s more opportunity to keep the kids amused while I sample beer… :o) I’m also happy to report that ALL of the money raised at the festival goes to charity. So good on them. You’ve just gotta love things that have been aged in Oak, haven’t you? I’ve been reading about the 5X Suffolk Strong Ale for quite some time and how it may or may not have influenced or been influenced by the lambic brewing folks in Belgium, so I was glad that Eve picked up this particular bottle, as it’s a blended beer that contains some of that special oak-aged Strong Suffolk Ale. GKSDA pours an impenetrably darkly colour with some, but not much, in the way of garnet around the edges. There’s no head at all. None. Nada. Zero. I guess over time the head producing proteins and sugars, etc, that you get in younger beers just degrade or deteriorate (or maybe even get fermented out by a wilder type of yeast). The aroma is vinous and alcoholic, with yeasty fruitiness. OId leather and mahogany themes dominate. I also got way over-ripe wind-fallen orchard fruits, pear skins and the such-like. It’s a very complex aroma indeed and worthy of this aged and well-blended beer. The taste is all dark malts and warming alcohol. Softly fruity, it’s a lovely mouthful. Towards the swallow you’re once again regaled with oak and mahogany woody notes with rich leather and coppery metallic decoration. A gentle malty sweetness rounds the whole experience out. 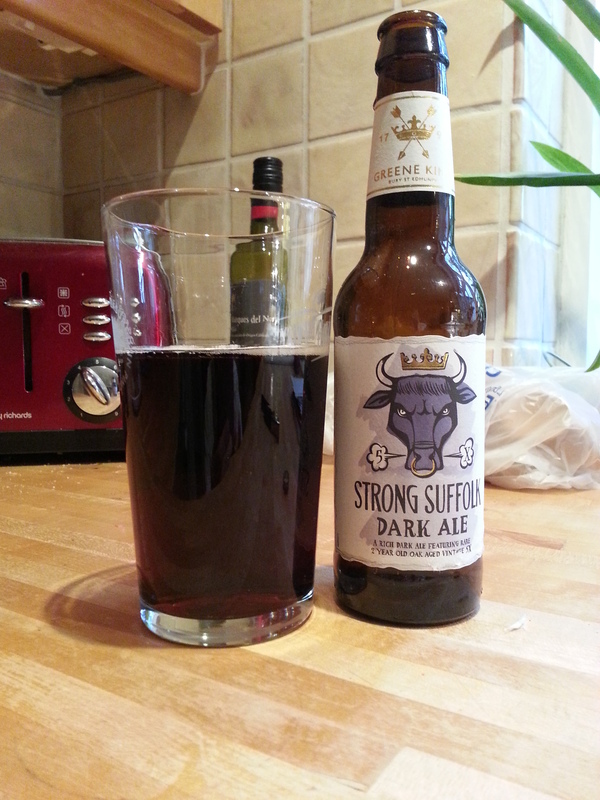 If I had to sum up Suffolk Dark Ale in two words they’d be “Antique Shop”. Probably best enjoyed on a dark winter night by the fire. Marvellous. 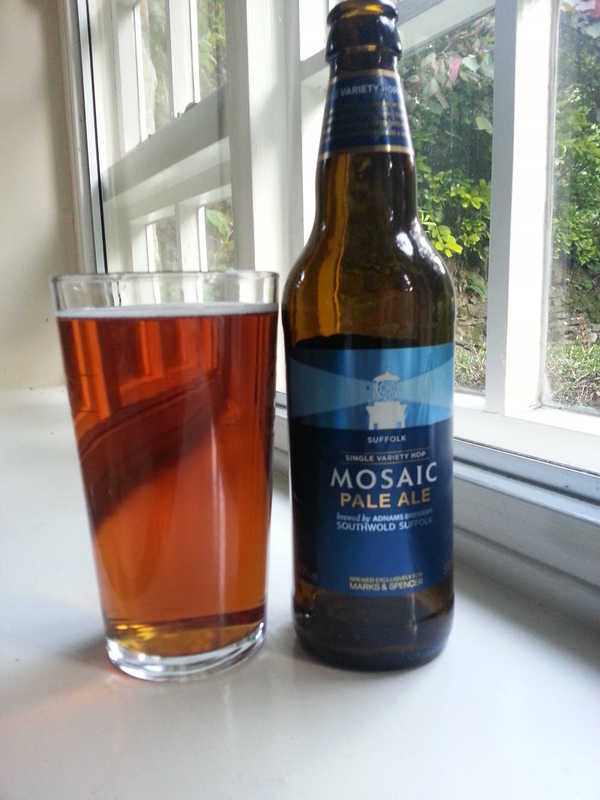 Mosaic Pale Ale is a marvellous gingery-brown and has a head that doesn’t hang about. The aroma…my crikey, the aroma…rich and heady, almost like – as spike Milligan would say – the incense-drugged bazaars of the Occident; for some reason it reminded me a bit of Turkish delight – it’s that intoxicating. Now I remember where I’ve smelt it…the Souk in Marrakech: that’s what it’s like and it’s all fragrant and mysterious and unusual because of it. As well as that beautiful overlying aroma there’s also tropical fruits by the bucket. Blimey, folks, this is a single hop beer and it delivers all of this. Marvellous. A velvety smooth mouth feel with a pleasing bitterness starts off our journey to taste-town. Like a can of Lilt it’s totally tropical, whilst also having a definite complexity about it…but – and it is a but, I’m afraid: there’s a little too much carbonation for my liking, especially for this strength of beer (4.2%); and the malt could also do with beefing up a bit – so that it really shines through. The carbonation and the current malt bill make this beer seem just a teeny bit “thin”. PPS: Pimms beer, that’s what Eve reckons it is. Something for tucking away on sunny Saturday afternoon….